Kuwait, September 11, 2017: Zain Group, the leading mobile telecommunications provider in the Middle East and North Africa, announces that it has successfully tested 5G technology achieving maximum throughput speeds of over 70 Giga Bit Per Second (Gbps) over 2GHz spectrum. This speed represents one of the highest-ever recorded in the region, placing Zain at the forefront of 5G innovation for the benefit of its consumer and enterprise customers. 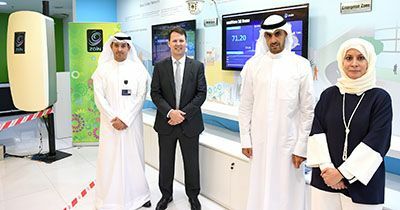 The testing occurred at the Zain Innovation Center in Kuwait in the presence of Bader Nasser Al-Kharafi, Zain Vice-Chairman and Group CEO, Scott Gegenheimer, Zain Group CEO-Operations, Eaman Al Roudhan, CEO of Zain Kuwait and other senior management from the ranks of the company. This proof-of-concept testing has been implemented by Zain in Kuwait with a view to boosting existing 4.5G LTE network throughputs across several key Zain operations, leading to the provision of superior customer experience and unprecedented network speeds. Widespread 5G connectivity will eliminate information islands, boost the prosperity of a digitalized sharing economy, promote changes to existing production methods and lifestyles, and finally improve people's quality of life. 5G can drive the process of full digitalization through the integration of wireless connections, mobility, Internet of Things (IoT), cloud computing, and big data. Based on a 5G infrastructure platform, the Mobile Broadband network will facilitate the transformation of diverse industries. The International Telecommunication Union (ITU) has revolutionized 4G capability by 10 times capability by defining 5G to reach 20 Gbps per cell coverage, to connect 1 million connections per Km2, and to provide 1 ms ultra-latency services. An example of such speeds is that a 1GB movie can be downloaded in seconds. 5G is designed to cater the rapid development of Mobile internet traffic regenerated by the increase popularity of smart devices, and by the usage of mobile broadband internet and video traffic. There is also a trend to more immersive services based on new Virtual and Augmented Reality headsets, and consumers will want to experience these services wherever they are, so they must be capable of being used wirelessly. 5G can supply immersive experience enables people to watch movies and live sports programs, play games, shop online and work remotely anytime and anywhere with convenience, freedom and efficiency. Such services also enhance cooperation and interaction in fields like education, training, construction, city planning and oilfield exploration. Advanced vehicle technologies will enable the introduction of new safety and efficiency systems, and ultimately, driverless cars. These future generations of automobile will require sophisticated wireless telecoms capability accomplished through 5G in order to communicate with one another, with local traffic control systems, with manufacturers and with third-party service providers. The Internet of Vehicle ‘IoV’ and smart driving will eventually rely on 5G application scenarios. 5G will drive manufacturing transformation by enabling interconnecting the entire manufacturing supply chain. Data will be shared between different locations about key business aspects such as design, manufacturing and distribution; information about equipment and products; and even data about customers and suppliers so that operations in all these areas can be improved. Products will become channels, sharing data about, and enabling subsequent sales to, customers. Data marketplaces will emerge to take advantage of the new insights available. The factories themselves will be populated with more capable manufacturing robots, and densely equipped with sensors and automated systems. On-demand manufacturing will increase. Production flexibility and efficiency will improve. 5G enables industries to provide new models of cutting costs, increasing efficiency of processes, and improving population health. Meanwhile, it can offer to consumers an increasing array of commercial wireless monitoring or tracking services. With the combination of diverse wireless connectivity, mobility, IoT, cloud computing and big data innovative technologies, 5G offers a more comprehensive set of capabilities than other communication technologies. The 5G communication infrastructure will become a platform that realizes the target of enabling multiple industries with a single network. By taking advantage of the rapid and reliable communication capabilities of 5G networks, as well as the enormous number of connections, 5G will enable operators to better serve customers in all industries. Telecom operators will be able to position themselves as the ‘best enablers’ for industry applications.